Ann Bronte was the less-well-known Bronte sister. 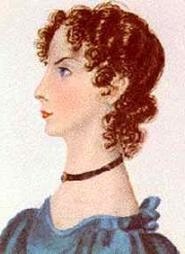 Most people recognize Charlotte as the author of Wuthering Heights. Both sisters wrote under the surname ‘Bell’. Ann wrote as Acton Bell and Charlotte as Currer Bell. I first became acquainted with Anne’s writing this week, when I picked up her novel, The Tenant of Wildfell Hall. Anne’s literary output was limited to poetry and two acclaimed novels, the one already mentioned and Agnes Grey. Both novels are considered by critics to be feminist works. My observation is that this is certainly true of The Tenant of Wildfell Hall. While the book has all the earmarks of a Gothic, it is essentially a story of one woman who asserts her independence despite physical and social obstacles. I love this book. Admittedly, I am addicted to 19th-century fiction. Anne Bronte died at the age of 29. I wish, for her sake and ours, that she had lived longer. We surely would have seen great work come from this astute intellect.